Enhance Style and Comfort with Window Tint. Make your vehicle look better and the interior feel more comfortable with expertly installed window tint from Precision Audio in Bainbridge and Thomasville. We provide expert installation and precision fitted, high quality Llumar brand window film so you’re ensured of a great window tint job that will provide years of style and comfort. At Precision Audio we offer the highest quality Llumar brand window film available. We utilize four tiers of window film to best fit your budget and vehicle needs. Dyed Window Film – This high-quality film gets its darkness from a UV stable dye so that, over time, the shading remains consistent and does not fade, turn purple or streak. It’s available in all levels of darkness, from very light tint to super dark “limo” tint. This tint, like our installation labor, carries a one year product warranty. Metalized Window Film – This film utilizes a hybrid metalized construction that adds to its UV and heat rejection properties. It’s especially efficient at keeping interior temperatures cool while also preventing premature fading of interior fabrics. Darkness levels are available from very light all the way through limo tint dark. This tint carries a lifetime product warranty. Ceramic Window Film – This is our top-grade window film with the greatest UV ray filtering and heat rejection properties. It’s ideal for high-volume cell phone or Bluetooth streaming audio users because the ceramic construction does not obstruct the wireless signals in any way. Besides being the best quality film we offer, ceramic film also has a nationwide lifetime warranty so should anything happen to your window tint while out of the area, we can refer you to a local tint provider who can warranty and replace the damaged film. This provides an incredible value and peace-of-mind. Clear Windshield Film – Since it’s both illegal and dangerous to apply dark tint to the windshield of a vehicle, our latest offering is optically clear windshield film called Air 80 and it features incredibly efficient filtering of UV rays and substantial heat rejection. This is very complimentary to our other window tinting films because it completes the package so your vehicle remains minimally exposed to heat and the sun’s damaging UV rays. This is also a very helpful tool to minimize premature dashboard cracking and wear. 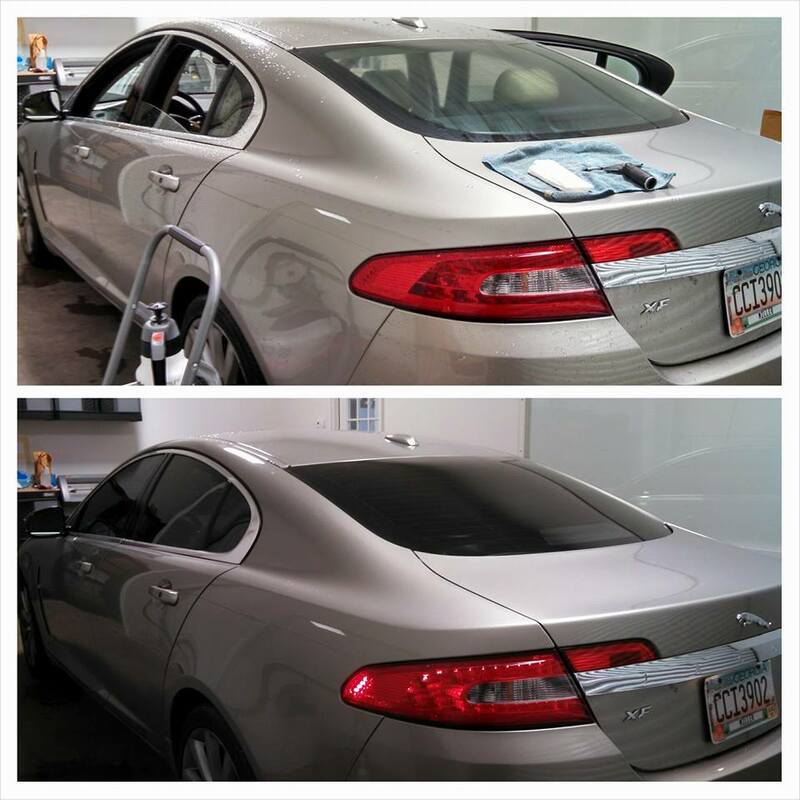 Some advantages of window tinting besides the overall appearance enhancements are the quality and degree of UV filtering. When your window tint filters out harmful UV rays, it benefits your skin as well as the vehicle’s interior surfaces. Heat rejection is also a benefit that keeps your air conditioning from working as hard to cool the car on those hot and humid summer days. Our window tint experts are happy to demonstrate our window film types and evaluate your specific needs to best recommend which suits your vehicle and budget. One of our competitive advantages is that we utilize computerized trimming of your window film prior to installation. This eliminates costly waste which would otherwise be passed on to the customer. Instead, we expertly install the window film that’s been trimmed to precision accuracy for your vehicle’s windows. Our window tinting work takes place in a separate enclosed area away from our other installation work. This ensures a dust and debris free environment so that your window film installs on the glass with surgical precision and cleanliness. We guarantee all of our installation labor for a period of one year, so we execute the window tint installation in the cleanest possible environment to ensure we get it right the first time! In Bainbridge and the surrounding South Georgia and North Florida communities, we are the experts at window tinting. Contact us today or call (229) 246-2111 (Bainbridge) or (229)233-5001 (Thomasville) to schedule a no-cost consultation to evaluate your vehicle’s window tinting needs and we’ll make your customer experience trouble-free and enjoyable.